Considering that he's often called "The World's Mightest Mortal," most of Shazam's major enemies are the kind of world-shattering threats that you'd expect. There's Black Adam, who channels the same thunder and lightning superpowers that Shazam does, but on the side of evil. 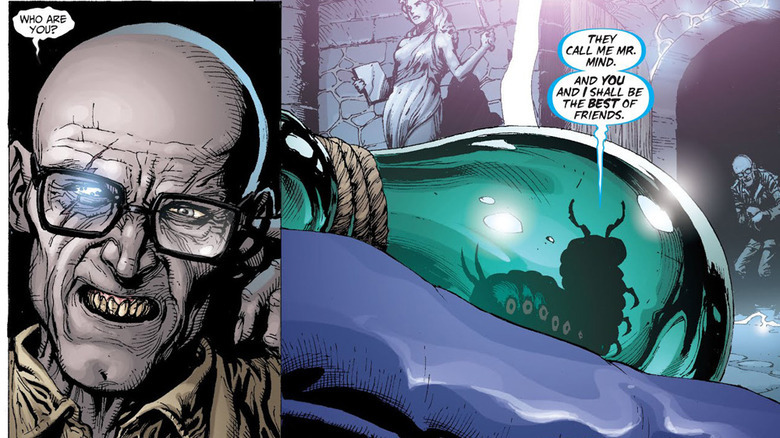 There's Dr. Sivana, a twisted mastermind with designs on conquering the entire world — and, for some reason, the planet Venus. There's Captain Nazi, a fascist superman who… well, that guy's deal is probably pretty obvious. 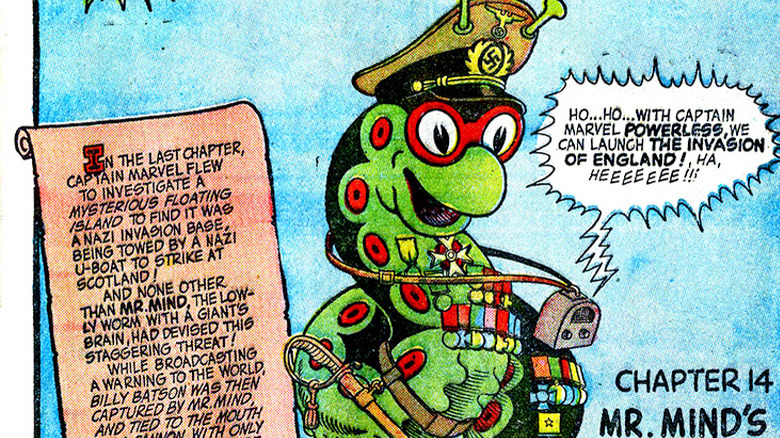 And then there's Mister Mind. For over 75 years, one of Shazam's most ruthless, sinister, and powerful enemies has been a tiny little cartoon worm who wears tiny little cartoon glasses and has to talk through a tiny little radio. But don't judge him by his adorable appearance — either on the comics page or in the credits scene following 2019's Shazam! movie, during which he reveals himself as our hero's next major threat. He's one of the greatest villains in comic book history, even if his most diabolical plot won't be reprinted any time soon. As for why that is, here's the untold truth behind Mr. Mind. Mr. 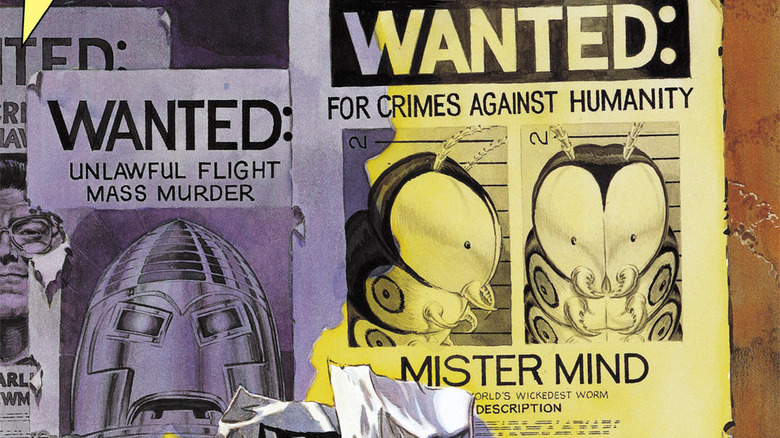 Mind made his debut in 1943 in what's commonly regarded as one of the most important and, on some levels, the best story of the entire Golden Age of Comics: "The Monster Society of Evil." That big high concept? Instead of having a single villain show up to battle the hero and then be defeated at the end of the story, creators Otto Binder and C.C. Beck decided to bring back all of the villains and unite them into a single monstrous, evil society called, well, the Monster Society of Evil. If that seems like a pretty simple idea, that's because it is, and it's one that superhero comics would go back to every time they needed to raise the stakes. Keep in mind, however, that this was only five years after Superman made his first appearance, when the superhero genre was in its infancy. Most super-villains at the time were meant for single stories, and bringing them back as a united force was pretty revolutionary. The way that the story was told was a whole new idea, too. In a time when most comics contained multiple self-contained stories that crammed a beginning, middle, and end into as few as 8 pages — something that would be a pretty standard practice until the dawn of the Marvel Universe nearly 20 years later — "The Monster Society of Evil" took its cue from movie serials. Starting in Captain Marvel Adventures #22, the story sprawled out over the next 25 issues before finally wrapping up after two years of comics. That's a long story by today's standards, and in the Golden Age, it was downright epic in every sense of the word. And Mr. Mind was right at the center of it. At the start of "The Monster Society of Evil," Mr. Mind only appeared as a disembodied voice crackling over a radio. The true identity of this mysterious mastermind who was uniting all of the world's greatest villains — a roster that, incidentally, included Adolf Hitler and Benito Mussolini along with fictional supervillains like Mr. Banjo and the crocodile men — wouldn't be revealed for five months. 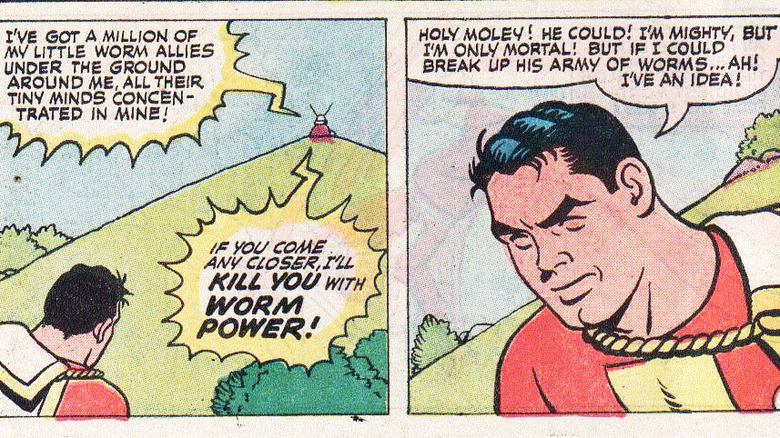 First, a strangely angry-looking green worm showed up in Captain Marvel Adventures #26, dropping onto Shazam's shoulder only to be brushed off. The next issue, after Mr. Mind telepathically commanded an army of termites to topple skyscrapers (which was somehow not his weirdest plan in this story), Shazam finally discovered his true identity. With that, the evil mastermind was revealed as a worm wearing glasses who spoke through a tiny little old-timey radio speakerbox fastened around his neck. Mr. Mind's origin was explained in pretty simple terms: he was, of course, a super-intelligent worm from another planet who came to Earth in order to conquer it, because that's what super-intelligent space worms do. Listen, if you already have people reading a comic where the villain is trying to help Hitler stop the rotation of the world so that Nazi Germany can enjoy 24 hours a day of pleasant noontime sunlight, you can skip out on a few of the details. After 25 issues of Shazam foiling schemes that included blowing the world in half with an underground warehouse full of dynamite (Captain Marvel Adventures #37), getting a bachelor's degree from a "school for evil" (CMA #44), and publishing an autobiography called Mind Kampf that would convince people to join him (CMA #41), Mr. Mind finally seemed to meet his end in Captain Marvel Adventures #46. Having lost all of his henchmen, Mr. Mind decided to make one last attempt at murdering his foe by waiting until Shazam turned back into Billy Batson and then dosing him with a bottle of ether, leaving him unconscious and at Mr. Mind's mercy. Fortunately for the good guys, Mr. Mind was, you know, a worm, and found it difficult to actually do any murdering without any hands. With that, he was taken into custody and put on trial for his pretty considerable crimes — which, according to Shazam, included the murder of 186,744 people. Even with that mind-boggling body count, it might surprise you to find out that Mr. 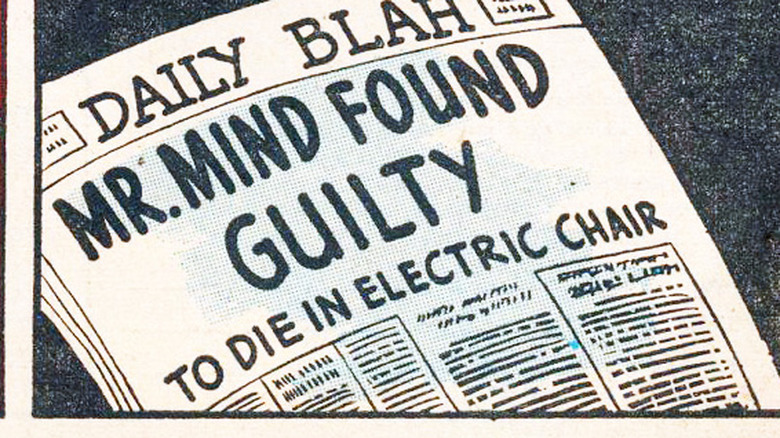 Mind was sentenced to death by the electric chair, and it's even more shocking that the execution was carried out right there on the page, with his body put on display afterwards. Golden Age comics did not mess around when it came to dealing with villains, and that was the end of Mr. Mind… for a while. "The Monster Society of Evil" was a groundbreaking and innovative story, but if you haven't heard of it, there's a reason for that. It's only ever been reprinted once, in 1989, in a version that was limited to 3,000 copies and wasn't even published by DC, the company that owns the character. The reason? Well, it's the same reason that there are very few people lining up to buy copies of Birth of a Nation: despite its high points and technical achievements, it's a story that's full of racist imagery. The idea of sending Shazam on a globetrotting adventure might sound good, but like many comics of the time, the tendency to rely on racist caricatures meant that Binder and Beck populated their version of Africa with jarringly offensive characters, and it didn't stop there. As was the case for a lot of media during World War II, including plenty of infamous Superman, Batman, and Captain America comics, Captain Marvel Adventures included Japanese characters that were grotesquely exaggerated to the point of being shown with fangs. To make matters worse, this story came out during a mercifully short period when Shazam had an extremely regrettable sidekick named Steamboat, a minstrel show stereotype that's offensively exaggerated even by the standards of the time. Considering that Shazam has always appealed to younger readers, it makes sense that DC wouldn't be in a hurry to have that kind of story brought back with a load of fanfare, even with an acknowledgment of its problems. No matter how important "Monster Society" might be, there are plenty of other great Shazam stories they could put back into print instead. 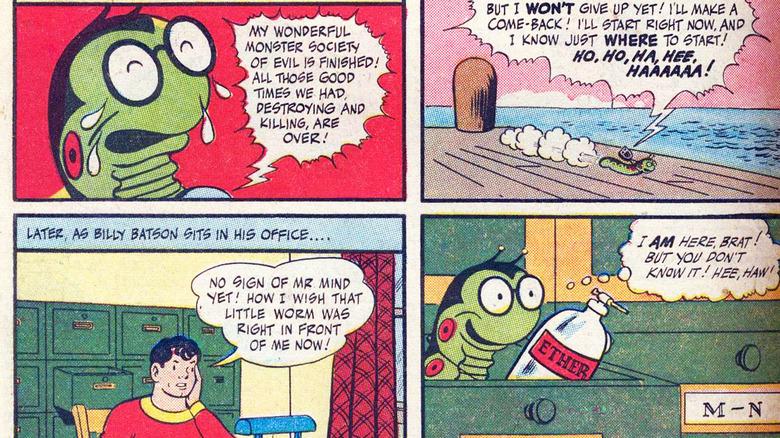 A villain resurrecting from the dead is hardly out of the ordinary in comics today, but Mister Mind's return to comics took almost 30 years. See, Shazam's first run in comics came to an abrupt end in 1954. It was partly due to a decline in popularity for superhero comics, but also resulted from a lawsuit from the company that would become DC, who had noticed that the Big Red Cheese had more than a few similarities to their flagship character. Two decades later, DC acquired the license to publish a new series, and Shazam returned to comics, along with some of his more notable foes. Mr. 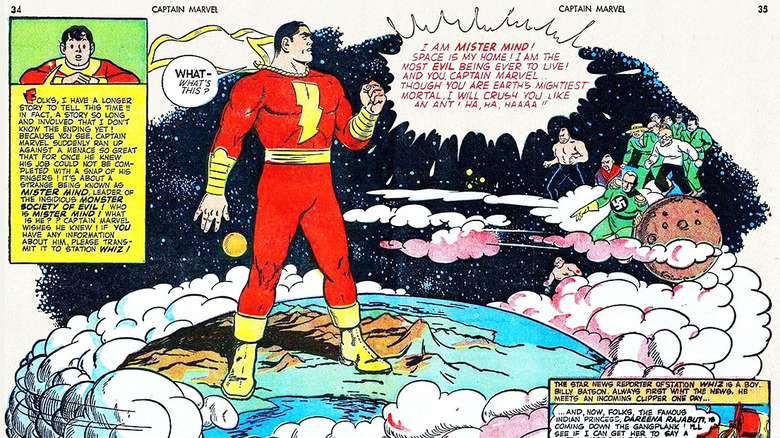 Mind returned in 1974's Shazam #9. While the events of "Monster Society" were mentioned, writer Denny O'Neil apparently didn't think that he'd need to provide a reason why Mr. Mind wasn't fried to a crisp, presumably because his last appearance was 29 years before. It's more weird that he talks about it at all, saying "Captain Marvel broke up my old organization and had me electrocuted! But I'm back and I'm more evil than before!" Needless to say, that last part is debatable. While he did try to use a "Hate Ray" to murder Shazam in that story, he didn't, you know, team up with Hitler. Again. Eventually, DC bought the Shazam characters outright, and after restructuring their universe in the '80s, they incorporated them into the DC Universe proper. That led to the 1995 launch of The Power of Shazam, which gave the Shazam family a modern update while still retaining some retro elements. Retro elements like, say, Mr. Mind's ridiculously high body count. In this version, Mr. Mind was a suitably pulpy-sounding Venusian mind-worm. He was one of many, in fact, with the entire species existing as a hive mind. In addition to telepathically communicating with each other, the Mind Worms could crawl into a human's ear canal and use mind-control powers on their host. The specific worm that we'd come to know as Mr. 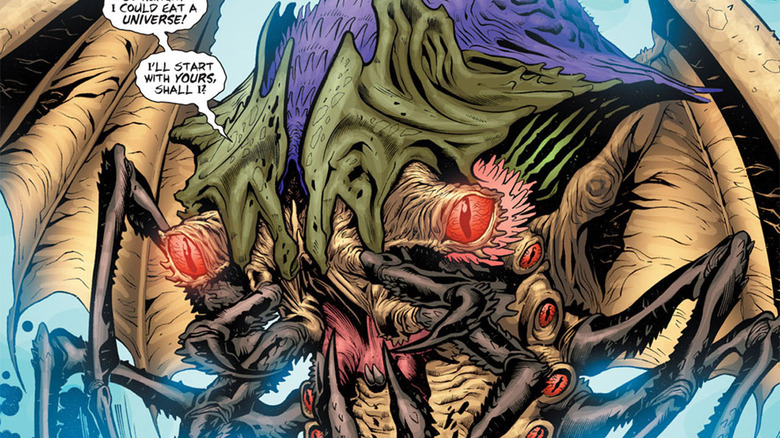 Mind was actually the second Venusian mind worm to target Earth, with references to a predecessor who showed up in the '40s, battled the superheroes of that day, and was hauled back to space to stand trial by that era's Green Lantern. His successor had a significantly greater impact. After gaining the power of his entire species when they were destroyed on Venus, he set his sights on Earth, looking for revenge. In one of the most shocking moments of violence in the entire series, he blew up Billy Batson's hometown (and everyone in it) with a nuclear explosion, and then attacked Washington, DC while wearing a humanoid carapace and projecting an illusion of a kaiju-sized mindworm. Eventually, though, he was apprehended by Shazam, and then popped like a water balloon by Sarge Steel. Mr. Mind's next appearance came in the pages of 52, a weekly series that chronicled a "missing year" of the DC Universe. In fact, he wound up being the main villain of the entire series. His big return came when it was revealed that Skeets, Booster Gold's faithful robotic sidekick, had been taken over by Mister Mind, who "ate him from the inside to make a cradle." At the climax of the series, an all-new, all-horrifying Mister Mind emerged from his technological cocoon as a completely different kind of threat. 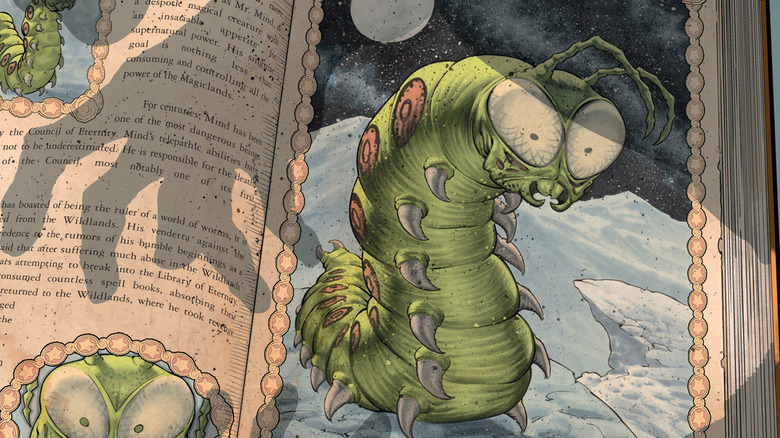 This Mister Mind claimed to be "the dominant life form on Earth between the dinosaurs and the humans," and evolved the ability to feed on time itself. In his new form, he could travel beyond our three dimensions into the borders of the multiverse, and devour entire parallel worlds to sate his endless hunger. That's a pretty wild threat, and needless to say, it required an equally bizarre solution. Fortunately, Booster Gold and Rip Hunter, the Time Master, had one in mind. They just used a "synthetic time" that was also a metal called Suspendium to trap the fourth-dimensional Mr. Mind inside of Skeets' old shell, and then spiked it like a football into the time stream where it exploded and turned Mr. Mind back into a worm. If that sounds complicated, it's because it is, but the short version is this: if you ever read a DC comic and spot a continuity error, you can explain it away by saying that Mr. Mind ate that timeline when he was a death butterfly. It's as good an explanation as any. Shazam himself was rebooted in 2011, and his roster of villains got a fresh new update as well. The most drastic change came for Dr. Sivana, but Mister Mind made an interesting return, too, and as weird as it might seem given how complicated the character has been in the past, the new version seems like a synthesis of the different approaches in his long, strange history. Once again, he's back to basics as a tiny worm, and once again, he's crawling around in people's ears with designs on controlling them. This time, though, he's teamed up with the current version of Dr. Sivana, who has a glowing eye with the nebulous ability to "see magic." With the reveal that the Shazam family can access an interconnected world of seven magic realms called the Magiclands, it became clear that Mr. Mind was also back to his dimension-eating ways, too. According to Sivana's copy of The Encyclopedia of Magical Monsters — which also gives his first name as "Maxivermis" — Mr. Mind's goal is "nothing less than consuming and controlling all the power of the Magiclands." Oh, and also that he killed King Solomon. You know, from the Bible? You'd think they would've mentioned the evil talking caterpillar in there somewhere. Considering that the 2019 Shazam movie is inspired heavily by Geoff Johns and Gary Frank's Shazam reboot, it stands to reason that if Mr. Mind ever becomes a big-screen villain, that might be the approach they go with.